← Getting the measure of the earth. Todays post combines two oft-repeated themes here at the Renaissance Mathematicus. We have another highly significant researcher who, however, does not belong to the pantheon of seventeenth century scientific gods and therefore tends to remain unknown to the non-experts. Our subject is also one more refutation of the widely held belief that in the seventeenth century Catholics in general and the Jesuits in particular were anti-science. Today we will take a look at the first man to be involved in a major scientific dispute with Galileo following the invention of the telescope the Jesuit mathematician, astronomer and optical physicist Christoph Scheiner, who was born in the town of Markt Wald in Bavarian Swabia on 25th July (NS) in either 1573 or 1575. Scheiner attended a Jesuit Latin school in Augsburg from 1591 to 1595 before entering the Jesuit Order in Landsberg am Lech in 1595. He was educated in Landsberg am Lech, Augsburg and Ingolstadt obtaining his doctorate in theology, the normal higher degree for a Jesuit, in Ingolstadt in 1609. Over the years he had held various teaching post in Bavaria and in 1610 he was appointed professor of mathematics in Ingolstadt. The chair for mathematics in Ingolstadt was the oldest in Germany and Scheiner had several illustrious predecessors including Peter Apian. Scheiner is notorious amongst historians of astronomy for his more than somewhat heated dispute with Galileo on the nature of the sunspots and who had the honour of having discovered them first. However this was not his only scientific achievement. One thing that I personally find fascinating is that Scheiner invented the pantograph in 1603 whilst still a student a fact that illustrates his ingenuity as an instrument maker. Although he first published his invention, which he had however already displayed publically on numerous occasions, in 1631. Now, if I had been writing this in the nineteen sixties or seventies I could be fairly certain that all of my readers would know what a pantograph is, however in this age of computer graphics where the most amazing graphical transformations can be accomplished by the most ham-fisted of us with the simple click of a mouse the pantograph like many other drawing instruments has almost disappeared from public awareness. A pantograph is an instrument for copying pictures and diagrams either one to one or scaled up or down. On the apparatus pictured above the three points at the bottom are the operative parts of the instrument. The instrument is anchored with the point on the left (XN) whilst the original drawing is traced out with the other hand with the middle point (MH) steering (OZ). The point on the right (PT) thus draws the required copy. By adjusting the length of the arms one can determine whether the copy is one to one, enlarged or reduced. The thing for which Scheiner should be most well known, but he isn’t, is his work on the optical function of the eye Oculus hoc est: Fundamentum opticum, which he published in 1609 1619. Although there were many competing theories of vision in antiquity the majority opinion was that the image was formed in the crystal lens at the front of the eye. Even Ibn al-Haytham who laid the foundation of modern optics in the eleventh century CE with his synthesis of ancient Greek optical theory believed that the image was formed in the lens. In 1604 in his Astronomiae Pars Optica Johannes Kepler made a radical change in that he claimed that the lens is just that, a lens, and the image in formed, as in a camera obscura (a name he coined), on the retina at the back of the eye. This is, as we now know, the correct solution. However Kepler’s suggestion did not go down particularly well as any such image would of course be inverted; we would see everything upside down! Kepler’s ingenious and correct solution to this problem was to suggest that the brain copes with this situation telling the viewer which side in up. Now Kepler did not offer any form of empirical evidence for his theories and so they remained more than somewhat disputed; enter Scheiner who delivered the empirical proof that Kepler was right and quite a bit more. Scheiner took bull’s eyes, the real things and not the middle of archery targets or darts boards. And pared them down so that he could see through the retina from outside of the eye. He then projected an image through the lens and could observe its inverted formation on the retina, Kepler vindicated. Unfortunately for Scheiner in most popular presentations of the history of optics this achievement is almost always wrongly attributed to Descartes. 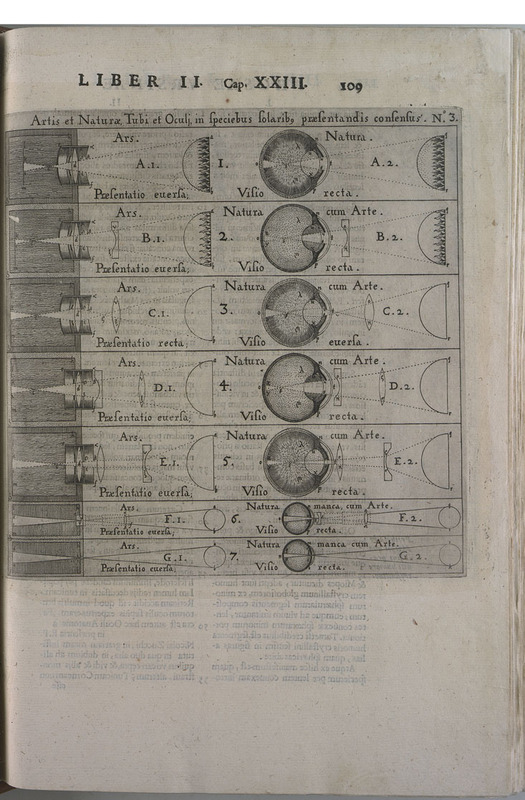 Scheiner’s work on vision contains many other important discoveries on the physiology of the eye making him alongside Kepler, Descartes, Gregory and Huygens to one of the important optical researchers of the seventeenth century. As already stated above Scheiner is most well know for his sunspots dispute with Galileo, which rumbled on for more than twenty years after its initial very heated phase between 1611 and 1613. 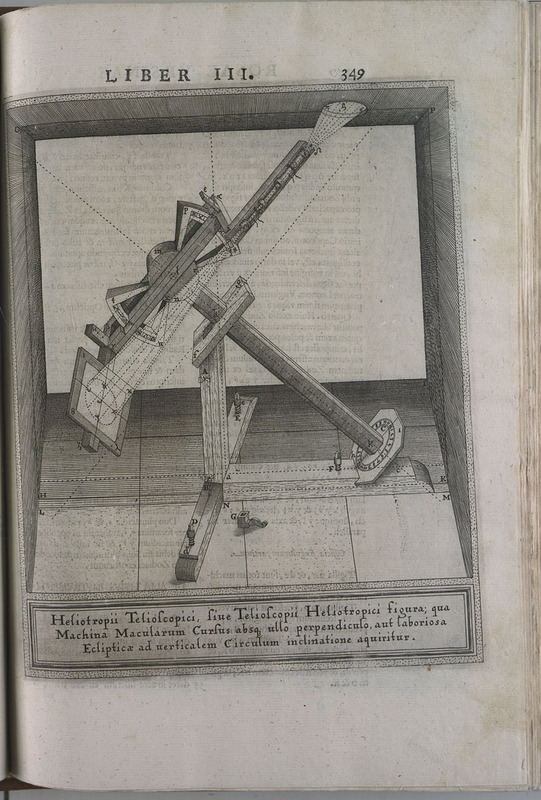 Scheiner and Galileo both began observing sunspots with a telescope around the same time at the beginning of 1611, although Galileo would later claim he had begun earlier in order to claim priority, whereas unknown to both of them the priority in observation went to Thomas Harriot in England and the priority in publication to Johannes Fabricius in Frisia. The Augsburger businessman and astronomy enthusiast Marcus Welser published two sets of three letters from Scheiner on his sunspot observations under the pseudonym Apelles latenspost tabulam a reference to the fourth century Greek painter Apelles who is said to have displayed his paintings in his shop window whilst hiding behind them to listen to any criticism that might fall from the viewers, hence the title of this post. Scheiner hypothesised that the sunspots were actually small satellites orbiting the sun and casting their shadows on its surface, a theory that preserved the Aristotelian perfection of the heavens. Galileo countered with three letters of his own written in Tuscan and published by the Accademia dei Lincei in which he proved by careful observation and mathematical analysis that the sunspots must be on the surface of the sun, something that Scheiner then came to accept. Welser had declined to publish Galileo’s letters partially because of the gratuitous insults against Scheiner that they contained, some of which even the Lincei removed. Later in his dispute with another Jesuit Orazio Grassi over the nature of comets, which would eventually lead to the publication of his Il Saggiatore (The Assayer), Galileo even went as far as to falsely accuse Scheiner of plagiarism. 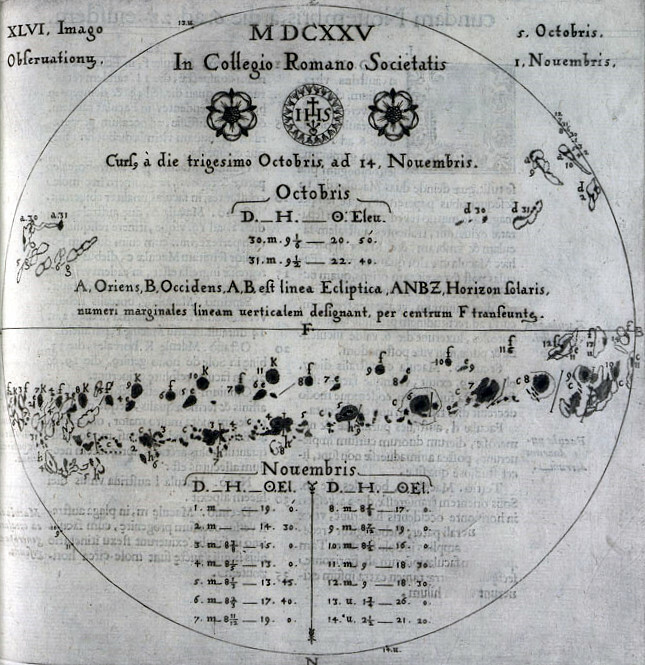 Unlike Galileo who basically abandoned his telescopic astronomy in 1613 Scheiner went on to make an extensive telescopic study of the sun, which he published as Rosa Ursina in 1630. In the first of the four books of his masterwork Scheiner very carefully detailed the sunspot observations made by Galileo and himself correctly attributing to each his discoveries, something that did not please Galileo at all. Galileo’s supporters rubbished the Rosa Ursina upon publication and the book being a rather turgid scientific study was a flop although it is without doubt one of the most important astronomical works published in the seventeenth century; it just wasn’t very readable! In his infamous Dialogo Galileo compounded his sins again gratuitously insulting Scheiner whilst knowingly claiming several of Scheiner’s discoveries as his own. Galileo was not a nice man. Initially Scheiner had built his own thirty power Dutch telescope and had, like Harriot, observed the sun at dawn through low clouds. Later at the suggestion of his assistant Johann Baptist Cysat, another Jesuit astronomer of some importance, he began to use filters of coloured glass so as not to damage his eyes. Scheiner was the first astronomer to construct and use Keplerian telescopes, two convex lenses, rather than Dutch or Galilean ones, one convex and one concave lens, for his observations, something that Galileo also criticised him for. The Keplerian or astronomical telescope is in fact superior but more susceptible to spherical aberration. It would be another twenty years before other astronomers, largely influenced by Galileo, followed Scheiner’s lead. For his solar observations Scheiner developed his helioscope a Keplerian telescope mounted on a sophisticated stand, which projected the image of the sun on to a screen. Scheiner was a first class astronomer and optician who suffered much under the arrogance and spitefulness of Galileo and who deserves to be much better known than he is. That Scheiner is the one who actually first performed the eye experiment is fascinating. The attribution specifically to Descartes starts very early; I presume this would be because Descartes’s Dioptrics was somewhat more widely read by French and English philosophers studying vision in the early eighteenth century, thus, when they were read, passing on the link between Descartes and the experiment long after Scheiner’s connection was forgotten. I suppose it’s another example to put in the list of things that one should be very cautious about what original discoveries one attributes to Descartes; the man was not exactly forthcoming about the sources of his ideas. 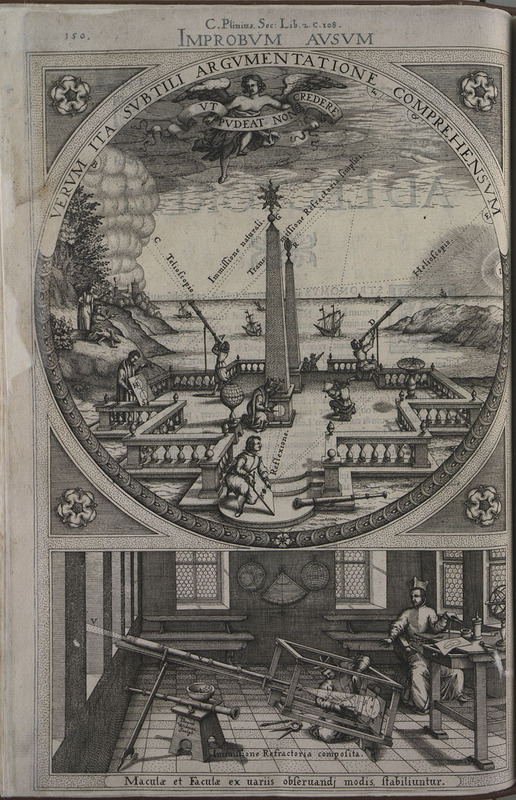 I’ve just become obsessed with late Renaissance science history (and this blog!) this summer and I’m just now making my way through my second Galileo biography. So forgive my relative ignorance. I will say that the one thing that really stood out once I started working through the historiography is just how much Galileo gets promoted at the expense of literally everybody else in the period (except maybe Kepler) and just how amazingly hagiographic the history was until quite recently. I was amazed when I read Westman’s article from 1971 about Galileo’s telescopic discoveries in the context of his search for patronage, and the reactions from other historians to it: Stillman Drake wouldn’t even call Westman by name in his (admittedly really interesting) response! In his recent Galileo biography Heilbron seems more or less to take Westman’s version of events (and particularly Galileo’s late interest in the phases of Venus) as obviously correct, so maybe things have been changing? This is even beside the issue of whether Galileo’s being “not a nice man” had negative effects on the development of natural philosophy in Italy. Just even claiming he was not a nice man and that he was concerned with more earthly matters than “truth” was controversial among historians as late as the 1970s! I had indeed found that post (or a similar one; I can’t remember) a few days ago while searching for Galileo criticism on the internet. It inspired me to read much of your archives. This is just a broad impression on my part, and I’m happy to be corrected, but the broad theme of semi-popular history I get is that the ONLY thing that matters in the early 17th century is the rejection of Aristotelian ideas, and everything Galileo does can be cast as a brave dissent from Aristotelian dogma. Not that there isn’t a lot of truth to that idea, but criticism of some elements of Aristotle’s thought is pretty widespread in Italy and the Netherlands by the 1580s and, also, not all scientific progress in the period required the total self-conscious rejection of Aristotle, e.g. Clavius and Scheider. (Also, Galileo smuggled a lot of Aristotelian metaphysics into his work that tends to get ignored.) The fact that Galileo was born into the most modern and stable part of Europe and reflected that culture as much as a singular genius also tends to get lost imo. Your impression is indeed very correct. There is a ‘traditional’ stream in the history of science, which sees the so-called scientific revolution as the rejection of Aristotle and all thing Aristotelian by the ‘moderns’. This view is however no longer tenable as more open eyed research has revealed strong essence of Aristotle in the works of such moderns as Bacon and Descartes and it is now acknowledged that the picture is much more complicated than was once thought. For me the nicest proof of this is the fact that Newton’s Principia is carefully structured in correct Aristotelian form, axioms and deductive logic, to ensure that is true sciencia. (http://www.humanities.mcmaster.ca/~rarthur/papers/BDFM.pdf); the citation for the published version (which I haven’t seen) is Journal of the History of Philosophy, 45 (1):1–28 (2007). Beeckman is certainly a possible future candidate for a post but these things are never planned or systematic. I can’t help contrasting the male images you are using with a significant art exhibition I am just gearing up to go see. Witches & Wicked Bodies. The advertising suggests its concern is charting how the printing press aided writers and artists to spread these myths concerning females throughout European culture. Durer, Goya and Blake, among others. One of the images it is using is William Blake’s, The Whore of Babylon, which presents rather a strong contrast to the above depiction of a reasoning male. A carefully constructed and crafted world as if in miniature. More Euclid than Aristotle, I think. But of course I agree with everything else in your reply. The theory of science that says that episteme/sciencia/knowledge is only guaranteed through logical deduction from obviously true axioms, which themselves require no proof, is from Aristotle from his Posterior Analytics. It is one of the ironies of the history of philosophy that the only fully worked out example of Aristotle’s scientific methodology in antiquity is The Elements of Euclid, as Aristotle denied mathematics the status of episteme, because the objects of mathematics are not objects of the physical world. Hmmm, interesting. I was referring to the form of the demonstrations in the Principia, which don’t resemble Aristotlelian syllogisms at all, but are obviously modeled after Euclid and other Greek geometers. Quite odd, compared to the usual meaning of postulate in math. Indeed, according to Heath, “Heiberg remarks that there is no trace in Aristotle of Euclid’s postulates”, although Heath does not concur. I see though that (at least in Motte’s translation), Newton refers to the “Axioms, or Laws of Motion”. But this use of the term ‘axiom’ agrees with neither Aristotle nor Euclid, where an axiom is (again going by the Posterior Analytics) something that is common to all sciences; Aristotle’s favorite illustration being “if equals be subtracted from equals, the remainders are equal”. On the other hand, the 1st, 2nd, and 4th of Newton’s Rules of Reasoning In Philosophy certainly do have the scholastic flavor. If we were obliged to assign a date to the birth of modern science, we would undoubtedly choose 1277, when the Bishop of Paris solemnly proclaimed that a multiplicity of worlds could exist, and that the system of celestial spheres could, without contradiction, be endowed with straight line motion. I learned about this stuff from Herbert Butterfield’s classic work, The Origins of Modern Science 1300–1800(1957). Marshall Clagett’s The Science of Mechanics in the Middle Ages is often considered definitive. 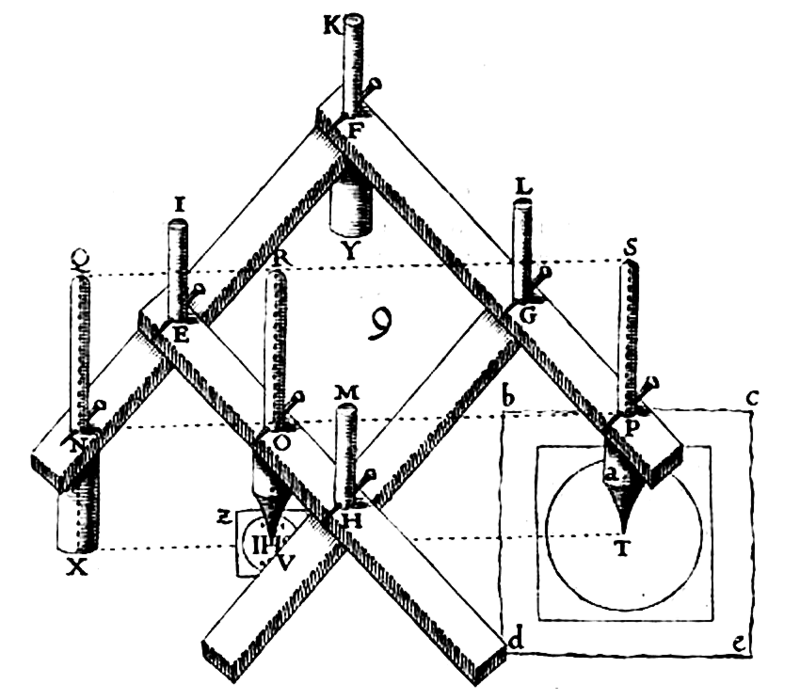 John Philoponus (c.490–570) already had made significant steps towards “modern” mechanics. The online Standford Encyclopedia of Philosophy has a good brief summary.